Ok, so you are immediately scratching your head, wondering what in the heck is going on with these photographs, right? I am in the middle of a nightmare over here. I got a new computer with Windows 7 and I couldn’t get my Photoshop Elements 7 to work correctly with it. Something about 64 bit / 32 bit incompatibility. I don’t know what it means, but I acquired Elements 11 and I couldn’t get it to work either. So these photos are failed attempts, but they will give you the idea. I am going back to my old computer with software from 2003, but I wanted to get this recipe posted before Thanksgiving. I hope you will understand. 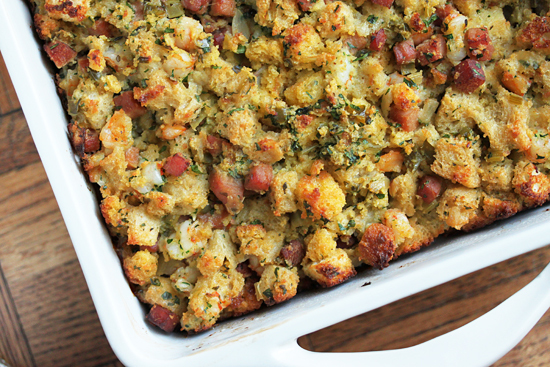 This Cornbread Stuffing is adapted from a recipe in Food Network Magazine’s November 2012 issue. It was one of those love at first sight things. I have never made stuffing with cornbread, nor outside the turkey, but the photo of this looked so delicious, I had to try it. 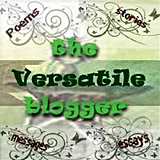 Plus I make really good cornbread and, yes, the recipe is at the end of this post. The stuffing looks crispy and browned on top, but underneath it is soft and more custardy. I am really looking forward to this stuffing doused in turkey gravy. And the leftovers. Guess what, this recipe makes a humungous amount of stuffing. I think serving 8-10 is conservative, so I froze 3/4ths of it to be reheated on the Day. The rest I have been treating as leftovers and being creative. The recipe does not have sage in it and I really am a sage stuffing kinda girl, so I was trying to figure out some way to get some sage into the leftovers. When I think ’sage’, what rolls off my tongue immediately is ’sage brown butter’. So I made some and sauteed the stuffing in it. Oh man, this was like buttery sage ambrosia. Then with the egg yolk dripping over the cornbread and salty ham bits, well, I have to tell ya, I was in sage-y egg-y heaven. See photo below. Drool. 1. 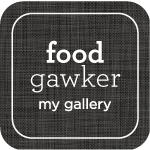 Preheat oven to 375 degrees F. Butter a 9×13 or 3-quart baking dish. Note: If white bread is soft and moist, place on baking sheet and dry in oven for 5 minutes. Turn cubes over with spatula and dry for 5-10 more minutes until firm and starting to brown. 2. Melt 6 tablespoons butter over medium heat in a huge skillet or Dutch oven. Add the ham and cook, stirring, until lightly browned. It may exude juice, but keep cooking until it evaporates and the ham browns. 3. Add onion, celery, bell pepper, tarragon, thyme and Old Bay, and cook, stirring occasionally, until vegetables are tender. Add the broth and bring to a simmer. 4. In a very large bowl (I used a 16-inch diameter), whisk the eggs and parsley. Add the cornbread cubes, white bread cubes and shrimp. With a large spoon or spatula, fold until egg is coating all ingredients and none is left in bottom of bowl. 5. Pour broth/veg mixture over bread cubes and fold in, making sure all cubes are moistened and no liquid is left in bottom of bowl. Try not to break up the cornbread cubes too much. 6. Transfer stuffing to prepared baking dish and dot with remaining 1 tablespoon butter. 8. Cover tightly with aluminum foil and bake for 30 minutes. Remove foil and bake for an additional 30 minutes, until top is golden. 1. In a medium sauté pan, melt butter over low heat. Add sage leaves and cook until sizzling and crisp, but still green. Remove to paper towel lined plate. 2. Continue to cook butter until golden and bits on the bottom are browned. Skim froth from butter and discard. Spoon about 1/2 tablespoon in a small bowl and reserve to drizzle over egg. 3. Crumble dressing into pan and sauté over medium low heat until starting to brown. 4. While stuffing is cooking, make poached egg by your favorite method. Drain on paper towel near sage. 5. 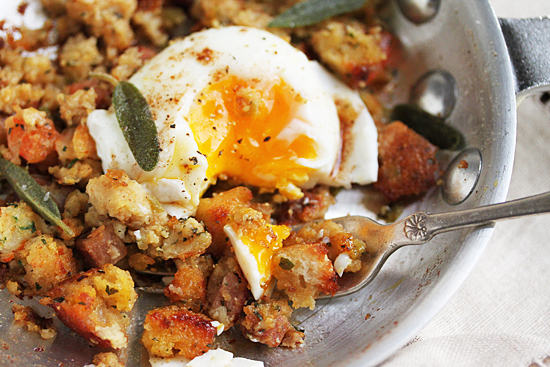 Place browned stuffing on plate and top with poached egg. Salt and pepper egg to taste. Drizzle reserved brown butter and crisp sage leaves over egg and serve. Looks like you have perfected poached eggs! The stuffing looks fabulous and I love the ham and shrimp combo. 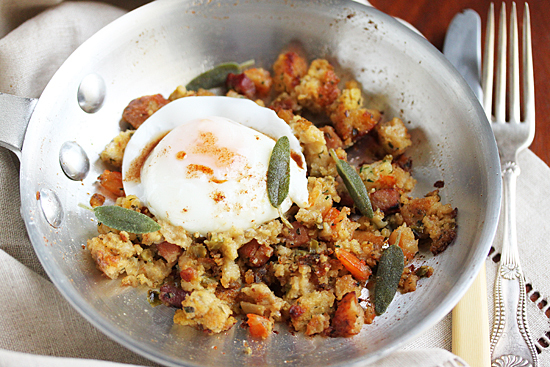 That’s very inventive—cornbread hash with eggs! Ha! Instead of cornbeef hash, one of my childhood favorites (from a can, of course).